When it comes to a transaction of vehicles between two parties, a DMV Bill of Sale Sample documents the transfer of possession between them. 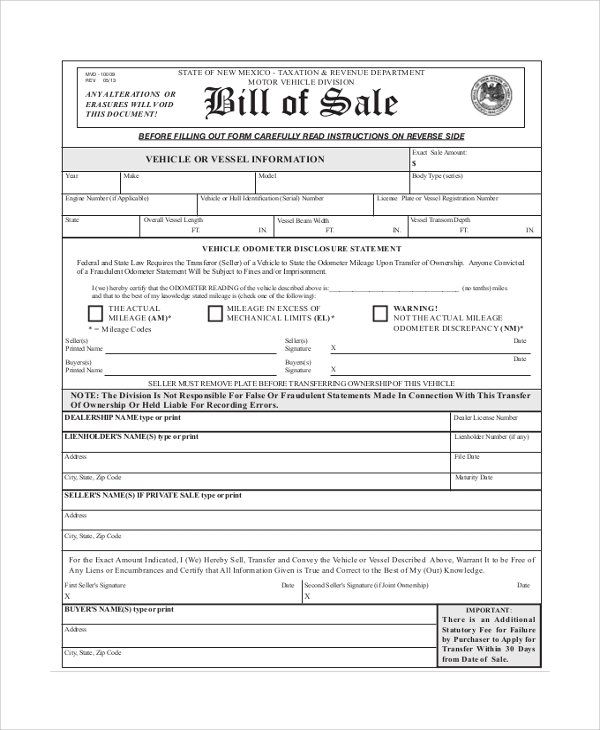 Whenever you buy or sell a vehicle, you will need this bill. However, it is not an official bill that records the ownership of a vehicle. It is rather a document of agreement between the two parties involved in the transaction. Depending on the purpose, there are some variations among the bill, as presented below. 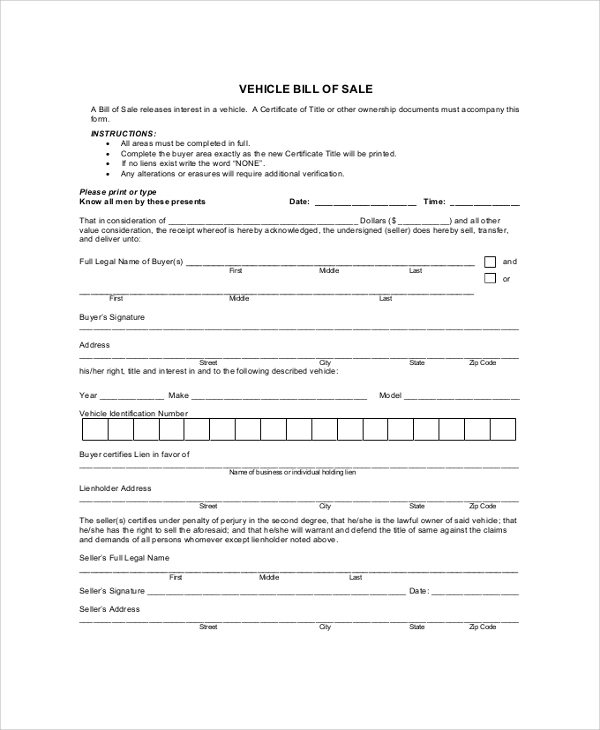 This form is mandatory when you sell a vehicle. 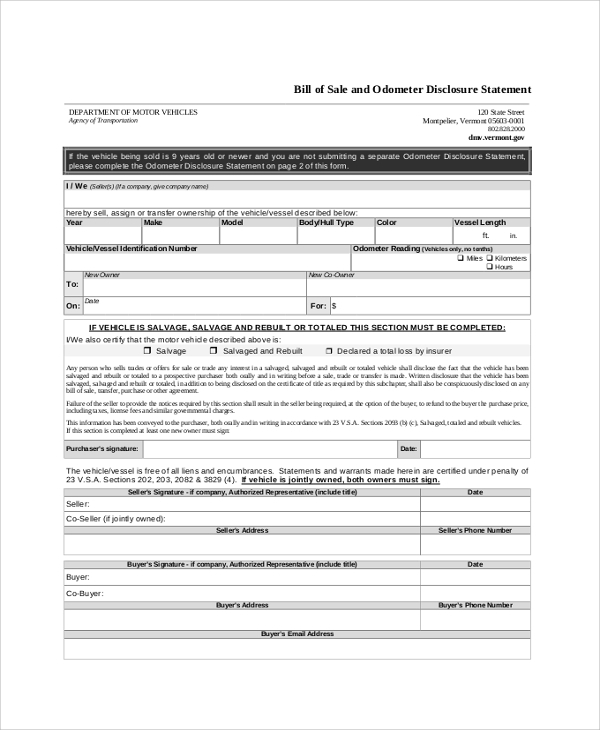 It contains all the details of the transaction, amount, and date. If the vehicle is gifted, the relationship between the two parties has to be clarified. This is a verification from the buyer’s end, stating that he or she is the lawful owner of the vehicle from that particular date. He is responsible for any damage to the vehicle and can sell it in future. This bill contains all the particulars of the car. 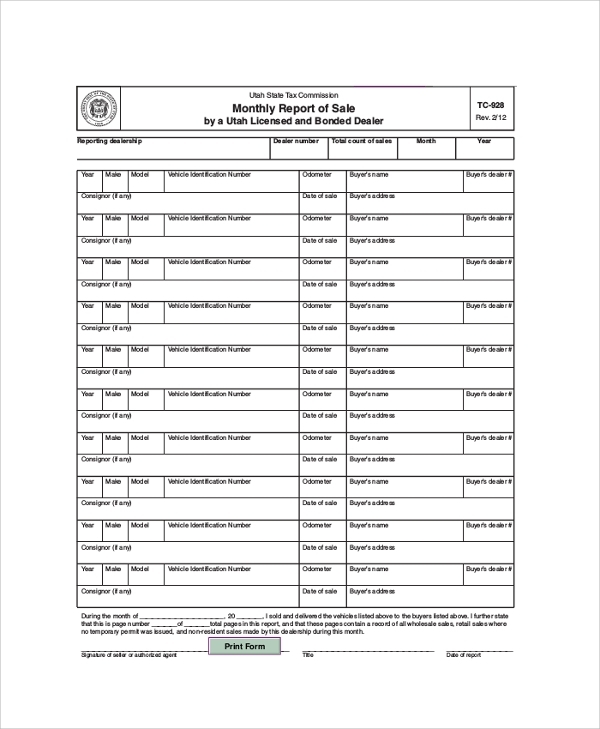 The names and details of both the buyer and seller are formatted at the bottom of the document. This particular bill is needed to disclose the information on the odometer of the vehicle. This is needed especially when you purchase a second-hand vehicle. The DMV Notice of Sale is required for taxation purposes and is linked to the municipal authorities. The new owner is responsible for paying all the taxes related to the vehicle. Irrespective of the fact whether you are a buyer or a seller, the bill benefits both the parties. In case you are a buyer, you will get an unhindered process of registration, especially if you are buying a new vehicle. It contains all the necessary particulars of the vehicle, including VIN, purchase price, odometer reading and so on. 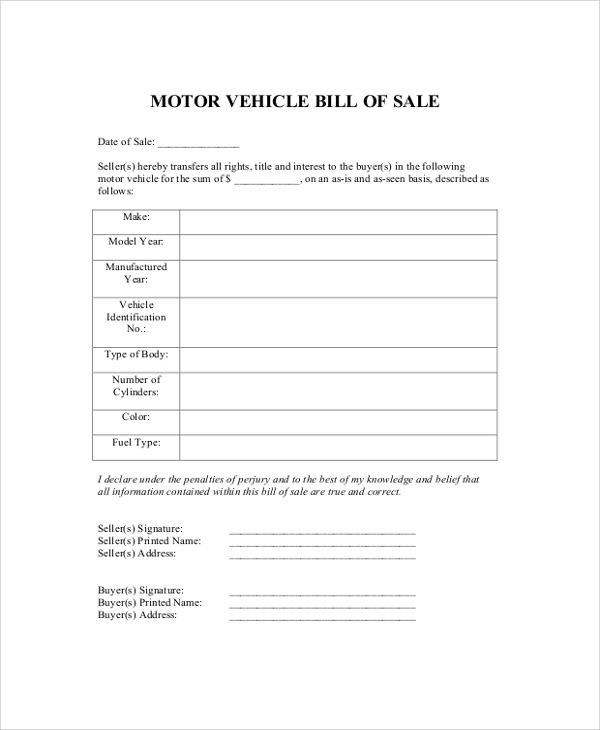 If you are a seller, you need the bill to prove that you are no longer the owner of the vehicle. Hence, if the vehicle gets involved in any accident or illegal activity, you will not be held responsible. In any case, you need to stick to the safe side. 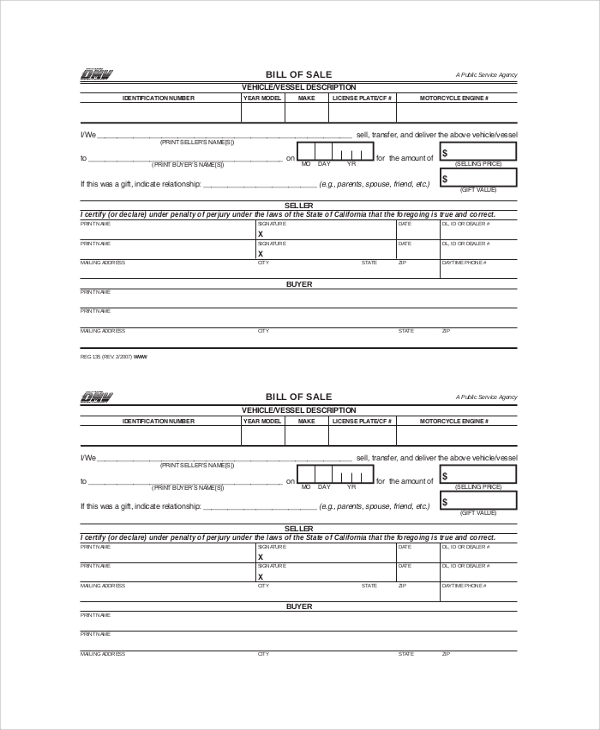 You may also see the Sample Bill of Sale Forms. When Do You Need The Bill? You will need the bill whenever you are involved in the transfer of ownership of a vehicle. You may be a buyer, purchasing the vehicle from the showroom of a particular brand. You may also buy a used vehicle. 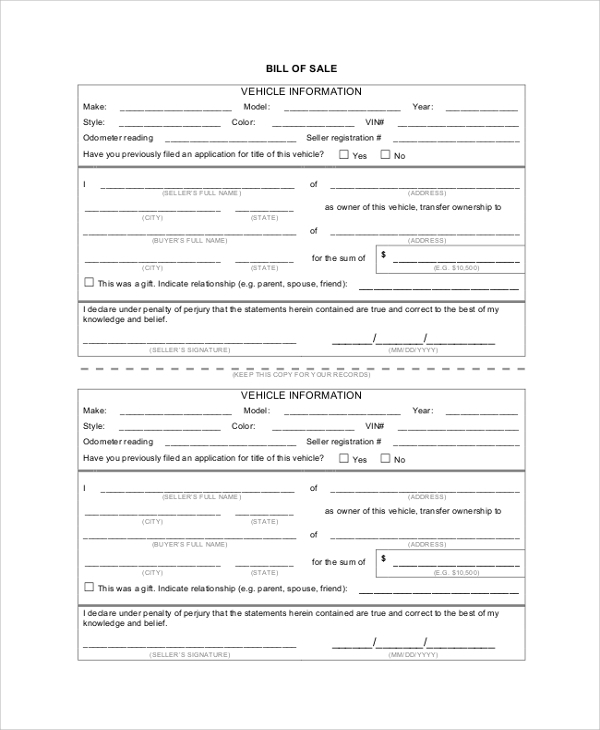 In any case, the document details the particulars of the vehicle. From the perspective of the sellers, it is a safe and recommended way to stay out of trouble on matters related to ownership of vehicles. This information can be verified against a Vehicle History Report, whenever required. You may need any of the above-presented variations of the bill. 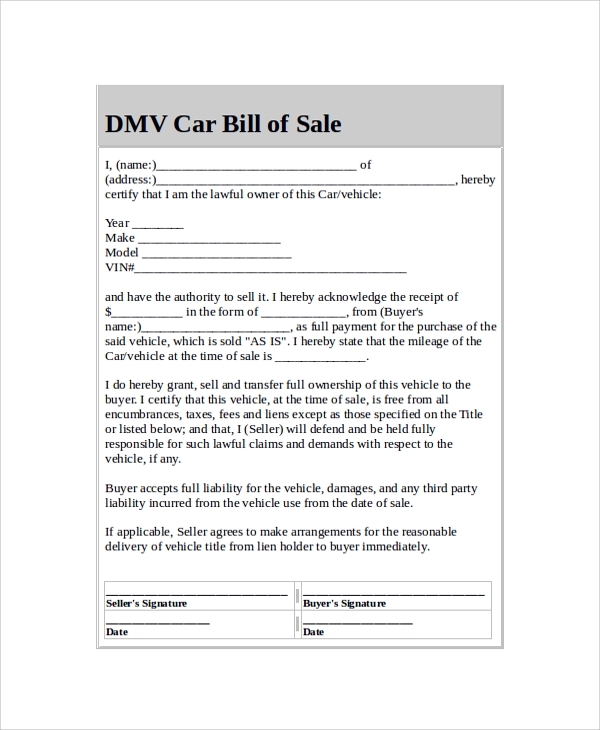 You can check out different Sample Vehicle Bill of Sale templates from the website and get the one you need. The bill is necessary to provide clarity over the current ownership of a vehicle. So, whenever you buy or sell a car, make sure that you use the bill.